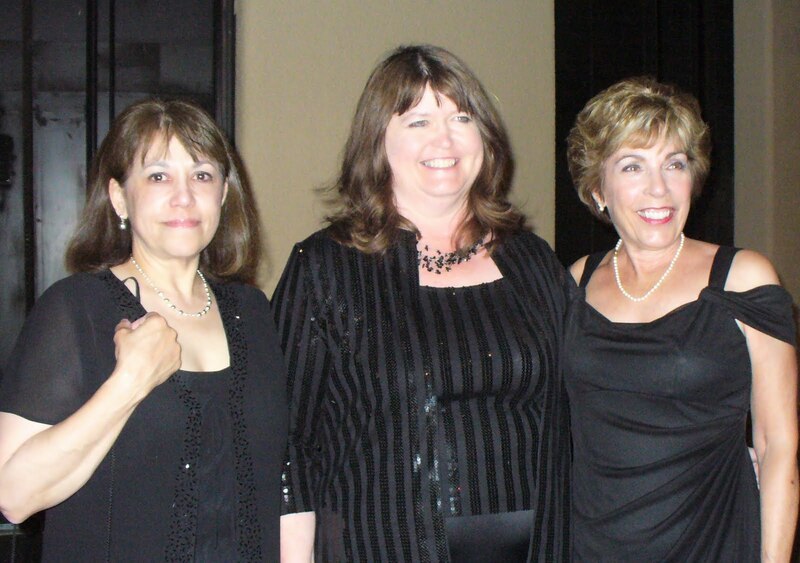 Last week I had the pleasure of traveling to the Romance Writers of America (RWA) conference held in New York City. The flight from Regina, Saskatchewan to Minneapolis, Minnesota was 20 mins late and I was in the back row which meant a mad dash from one gate to the one boarding for New York. By the time I blew in, the waiting area was empty since everyone had boarded except for one small family who followed me on board. To think I almost missed the flight to New York! And this was after Delta changed my flight from a morning one to afternoon. My first view of the Big Apple was when we broke through the clouds and the first thing I recognized was the Empire State Building. A few seconds later I caught the long needle-like shape of Roosevelt Island which I'd blogged about a few weeks ago in my post, 19th Century Mission Coffee House and also on my blog with the post, It Can't Be June. 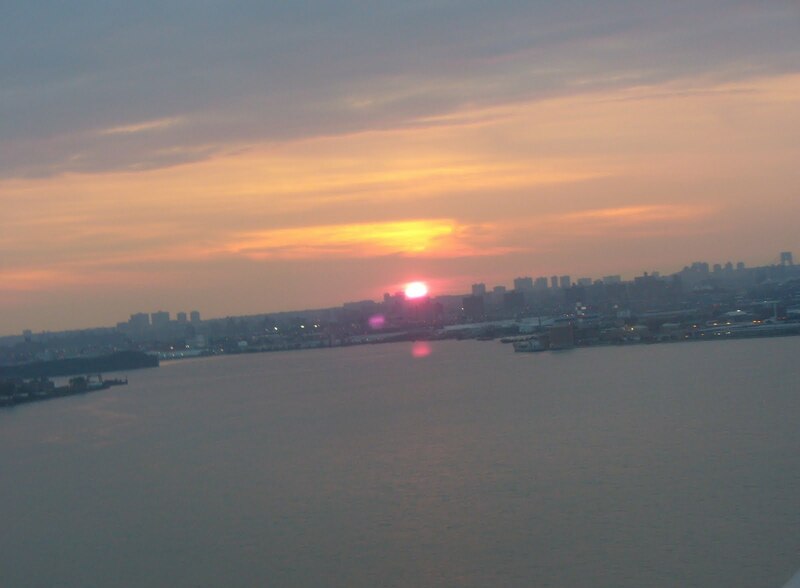 We landed at 9:30 pm at LaGuardia as the sun went down over the city. By 11 pm I'd reached the Marriott Marquis New York to start the RWA conference. The first person I saw was Missy Tippens and a couple other Seekers from http://www.seekerville.blogspot.com/ although I can't seem to find those pictures, now. And photos of a part of the Empire State building. I think the trip became real when I saw the tall building I'd once made out of snow for a snow sculpture contest. 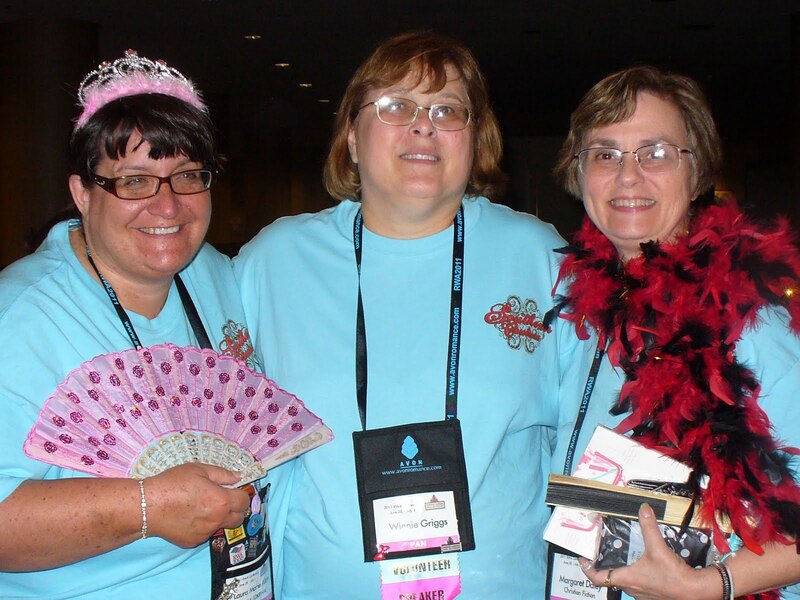 The first official meeting I attended was the Faith, Hope and Love (FHL) chapter of the RWA which included a worship session and the Touched By Love contest award ceremony. A few hours later I saw many friends and discovered new ones at the Author's Literacy Signing for charity. Like FHL Australian member, Abby Gaines. Wed night I attended the Harlequin Pajama Party where I found Allie Pleiter playing the role of Lady Liberty. Laura Marie Altom, Winnie Griggs and Margaret Daley do it up in style with spiffed up matching pajama sets. Camy Tang and I enjoying the party. 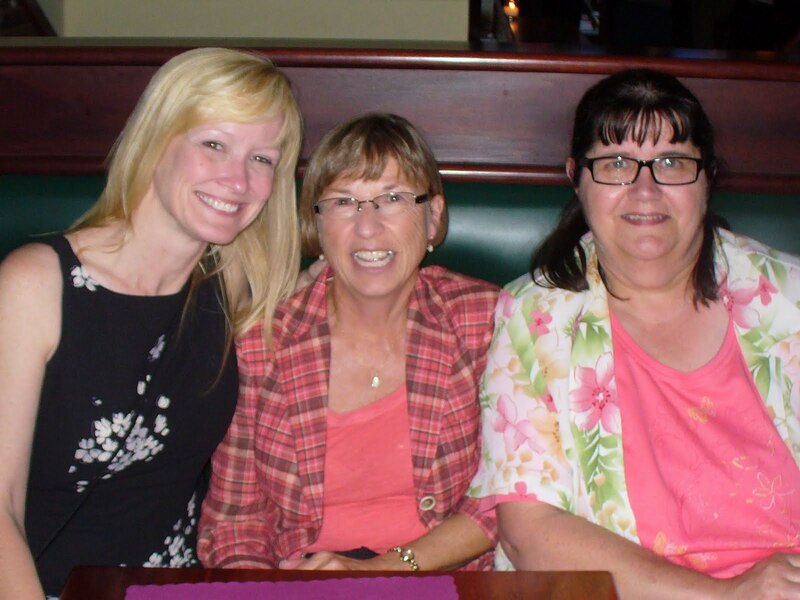 Thurs night Dana Corbit, Merrilee Whren and I went out to enjoy the atmosphere of a real Irish pub. The fish and chips were delish. For Saturday's lunch, I accompanied Rachelle McCalla and Mary Connealy to John's Pizzeria, a restaurant with a huge brick oven housed in an old church. Tina Radcliffe, Mary Connealy and Janet Dean were some of the 2,000 people dressed in their finest on Friday night for the Rita and Golden Heart Awards Gala. Earlier in the day I moderated Deeanne Gist's Bottoms Up: A Look at Victorian Women's Clothing From The Inside Out research session. Overheard by an attendee was the comment, "This is the best workshop I've ever attended at RWA." I agree. I was able to take a small amount of footage of Deeanne's workshop which I'll be posting soon as part of a History post. 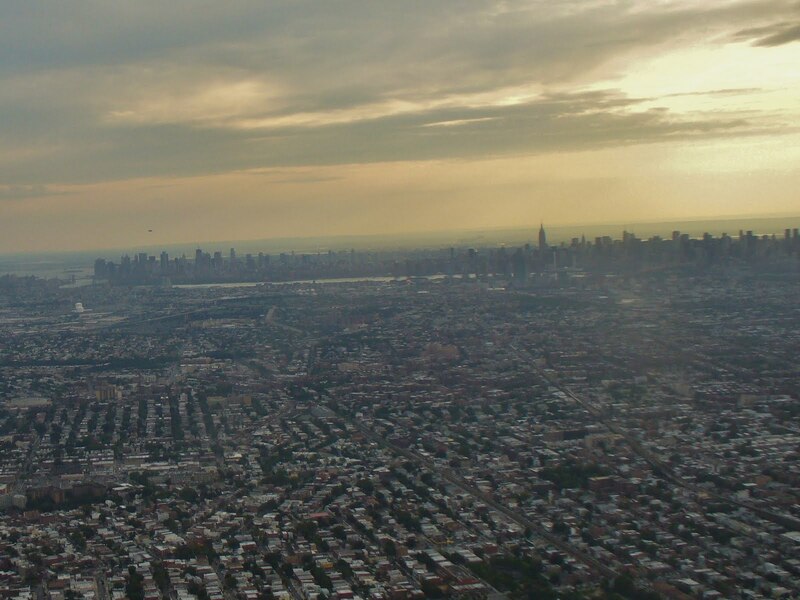 This was one of the last images I caught Sat night as my flight took off from LaGuardia with the setting sun in the background. Such a beautiful sight. 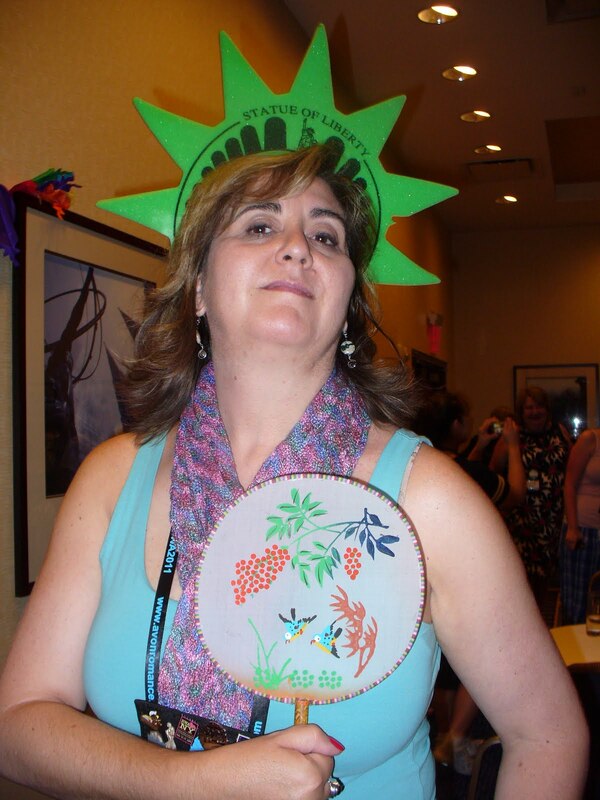 If you were at the RWA NYC conference, tell us something about your experience. 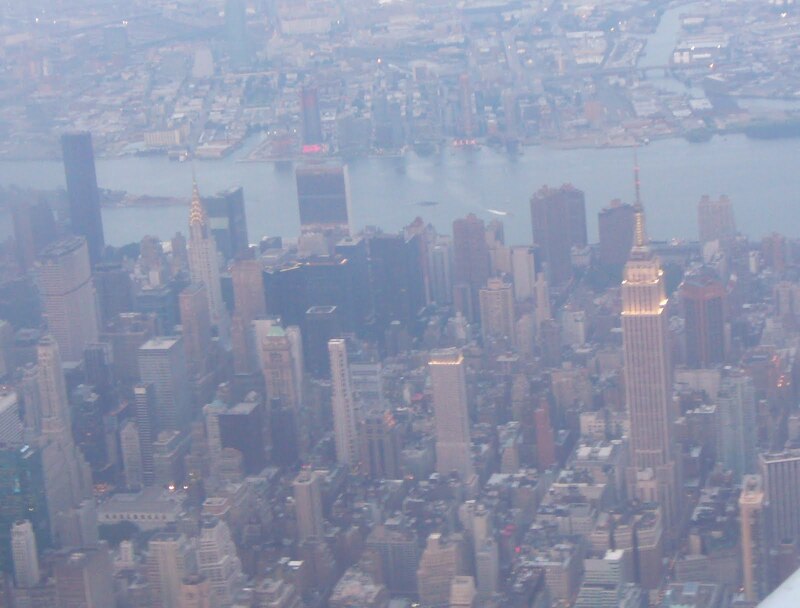 If you didn't attend, tell us what's the closest you've ever been to New York. Wow, Anita! Looks like you had a marvelous time! I hope you saw me waving furiously from the other side of New York State. I'm sure you came back from the conference all charged up and ready to write. Looking forward to that history post! When we lived in NJ, we would sometimes bus in on Saturday and walk around the city. One of my favorite experiences is when we saw Handel's Messiah at Carnegie Hall, and then the bus drove past all the decorated Christmas windows. Wonderful place to visit. Sounds like you had a blast! Sounds like you got to hang out with some really cool people. What fun! I've only been to New York City once. Nice place to visit but I wouldn't want to live there. Yes, I had a fantastic time. I almost went down to Macy's to window shop, but by that time I was developing blisters and knew I wouldn't be able to buy anything anyway, so stayed near Times Square. Yup, I hear you, Dina. That is one noisy city, although I'd been in the shuttle en route the hotel about 15 mins before I heard my first car horn. Once I reached the Marriott Marquis, however, I heard the horns and sirens all the way up on the 38th floor. While down in Times Square, the decibel level was so high, I couldn't imagine the silence of the prairie. Very strange. I would like to go back with my family, though. Hey Anne, that was one beautiful church. I originally added a photo of Mary with the stained glass dome up behind her, but decided to go with the one of Mary and Rachelle. I figured more readers would want to see who the authors are than another old church. However, I have enough photos of New York architecture to make a blogpost on that alone. These aren't my only pics, by any means, but the people in these photos are all part of the faith industry. Anita! Thanks for sharing your experience with us. It really makes me wish I could have gone. Next year! I love the pics, and I can't wait to read the history post. Hey Tina, it was great to spend some time with you as we hadn't crossed paths since Denver 09. Yes, you are adored for the fantastic job you do on the Weekend edition of Seekerville and ensuring the Seeker blog runs smoothly. But that alone doesn't mean you're bossy... just efficient. I'm looking forward to getting to know you better. Glad to have you on the team. And yes, it was a fun trip. And now I'm getting excited for the ACFW conference in St Louis in Sept. Yay! Thanks for sharing your trip with us, Anita Mae! It looks like such fun! 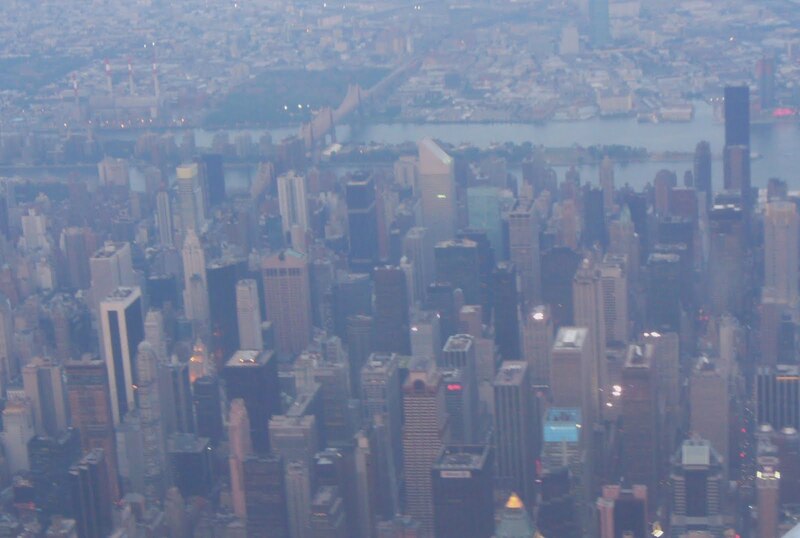 One of these days I'm going to make it to New York, and if I can make it there, I'll make it anywhere. Anita, thanks so much for sharing pictures from the conference! 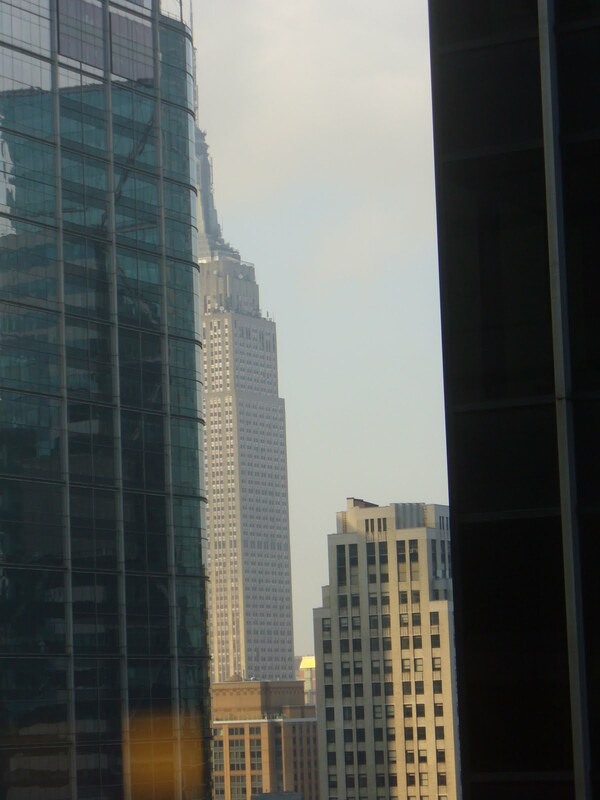 It looks like you had oodles of fun, and what an awesome view from your hotel room! Glad you're home safe and sound, all enthused and ready to roll! Hey Lisa, I have no doubt you'll get to New York some day. And since the RWA holds its conference there every 4-6 yrs, I think it's very feasible that you'll make it. You're welcome Niki and the rest of you who've said thanks for the photos. Yes, we had a wonderful view. I was quite worried at first when I read that one of my roomies, Carolyne Godin, had asked for a 'high' room. 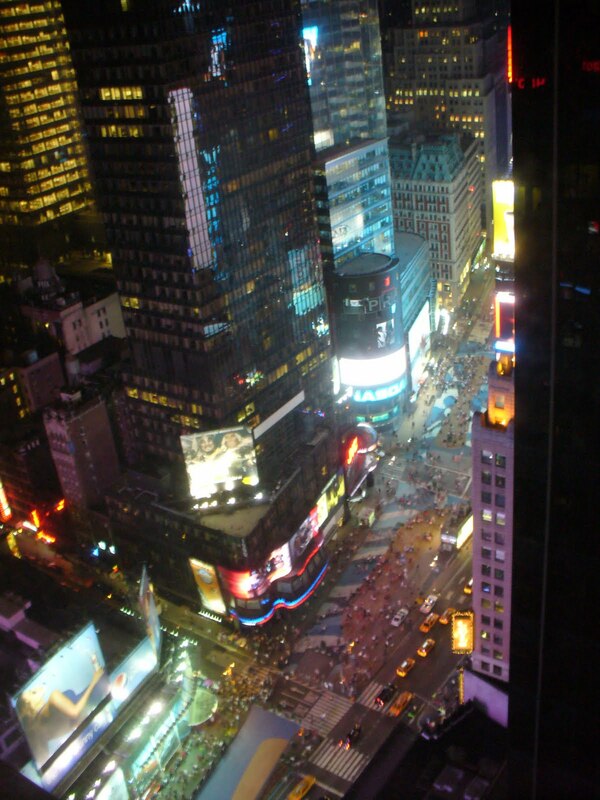 One of the first things I did when I got to my room at 11 pm that night was to look out the window and all the brilliant lights drew my gaze down to Times Square. I saw some guys unrolling a green carpet and wondered what it was all about. Then the next morning when I looked down, I saw a stage and people gathered around it. I didn't know until later that the stage was in front of the NBC Studios and Alicia Keyes had performed for the morning show. 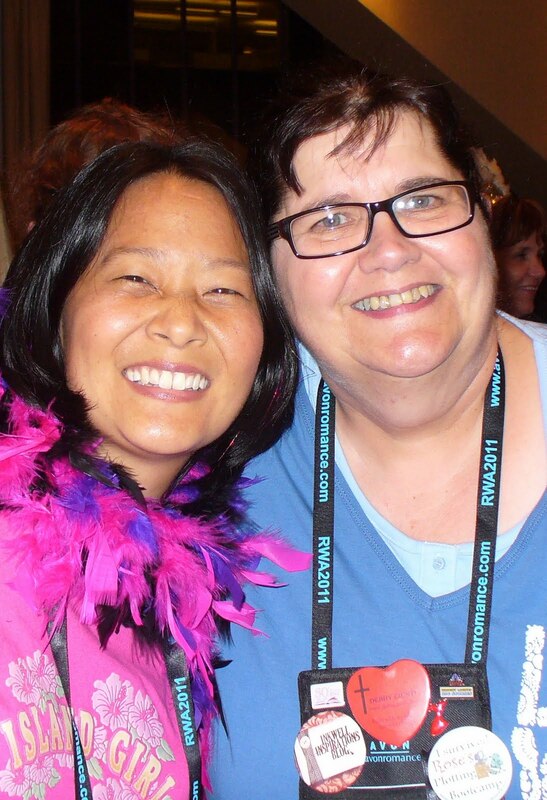 This was so much fun getting a peek at your time at the RWA conference! Sounds like you have a marvelous time in New York and at RWA11! Great pics, Anita. Does this mean you're headed for LA in 2012? 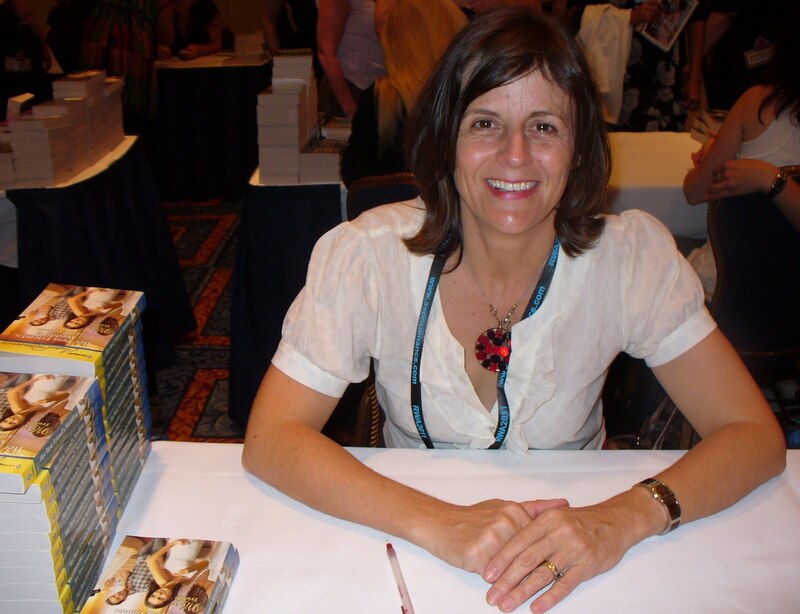 Hey Carla, perhaps we'll get to meet and share some good times at the ACFW conference in Sept? Hope to see as many on-line friends as I can either there in LA or in St Louis this Sept.
sounds like you had a great trip. New York is way too busy for me, but it is nice to visit in small bits. btw, guppy update @ eharl. i hope you got to spread your biz cards around and that they were well received. The biz cards were an enormous hit, thanks to you. Everyone who saw my brand oohed and awhed. However, the agent I saw was open to me writing mainstream and contemporary, too so will have to wait and see how that goes. It all depends on which agency I end up with. 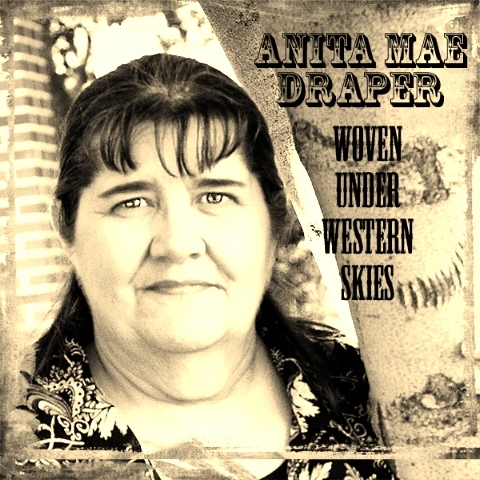 I enjoyed seeing your pics, Anita Mae. Meeting you in person at the end of the conference was an unexpected treat. Anita, New York City is just a totally amazing place. Not sure I'd want to live there unless I were quite wealthy, and something about that place just energizes the blood. So gla d you got to go and experience it. 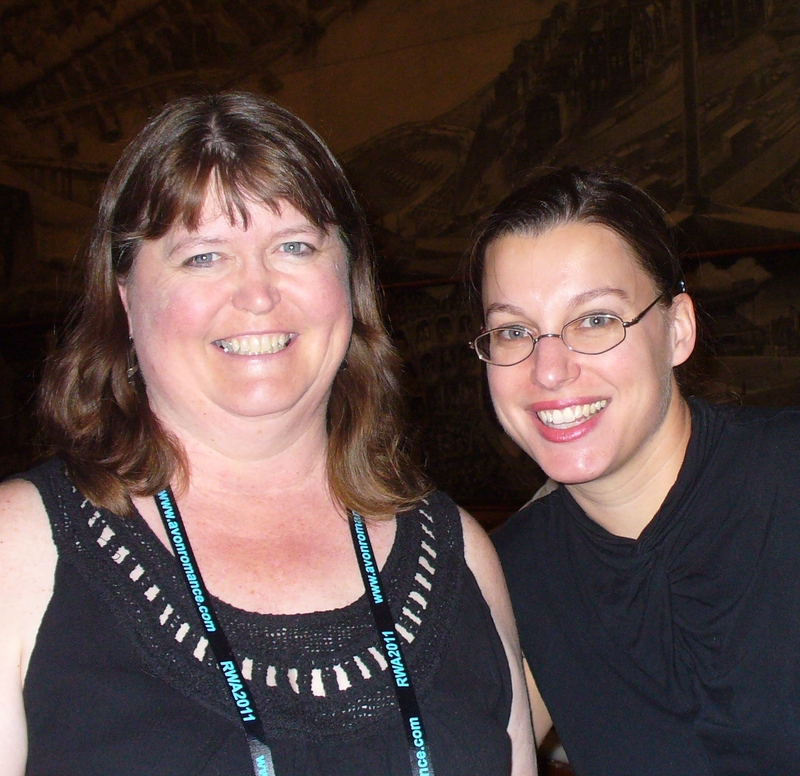 I am really hoping to get to an RWA conference soon, as I moved out of DC the day that the RWA conference started in DC in 2009. Literally the same day, alas. Thanks for sharing. Makes me miss going even more than I did last week. Sniff. Sniff. Was there in 2008 for some training.